I'm considering replacing the Washburn branded FR on my N24. Compared to my Wolfgang and other guitar that has a Floyd, thus one just feels cheap and seems to affect the tone in a bad way. Which model should I choose for a replacement? 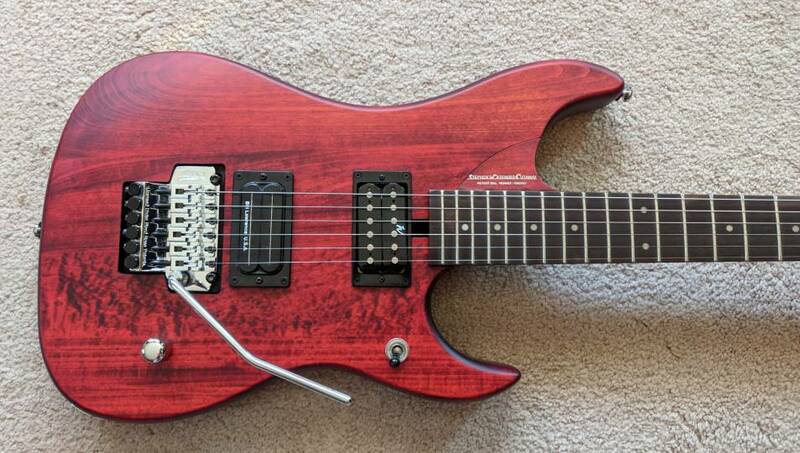 Re: Schaller, Gotoh or Original Floyd Rose? I'd go with the OFR and get a brass block upgrade for it. I prefer the German FR, and the German 1984 model if I have my way. Try to stick with the official FR upgrades if you want to keep the warranty in place. Plus, the official parts are sometimes more affordable. However, the Schaller LockMeister is easily as good, if not better, than what they make for FR. I have 2 LockMeister terms and they have been rock solid. I have a LockMeister on my N24, that replaced the FR Special it came with. And then an official FR brass claw (just $10, screws included). I’ll never touch another Gotoh. One started to wear at the knife edges, so I replaced it with a brand new one. Which started to show similar wear within a few hours. Others have had similar experiences. Schaller LockMeister same specs as OFR. Did your N24 have the angled route for the bridge, like mine has? Most of the replacement bridges that I'm seeing are more squared, which I think would require some routing. if I understand the question correctly, you are asking if the route is squared? or parallel/level/even with the guitar top? there have been many recess cavities with angled and with level. so you could be overthinking it a bit. you might do better hitting p a forum or a FB page the focuses more on Floyds. you should also be able to google for the routing specs for a FR recess. put those specs to play against what your have there to see if the basic route will handle the FR to begin with. if it looks like you might need to route for that, you can address the angled issue at the same time. I'd wait to have the FR in hand first, so you know how much (if any) routing might be needed. I can't tell for sure which Washburn trem you have there. I have a pretty old N2 with the Wasburn 600-S (?) that essentially a Takeuchi. it's always worked great and never had any issues with it. it might not have the "look" but it does deliver. I've never had any trouble swapping a Takeuchi Floyd with an OFR or a Schaller Floyd. Should just be a drop in replacement.